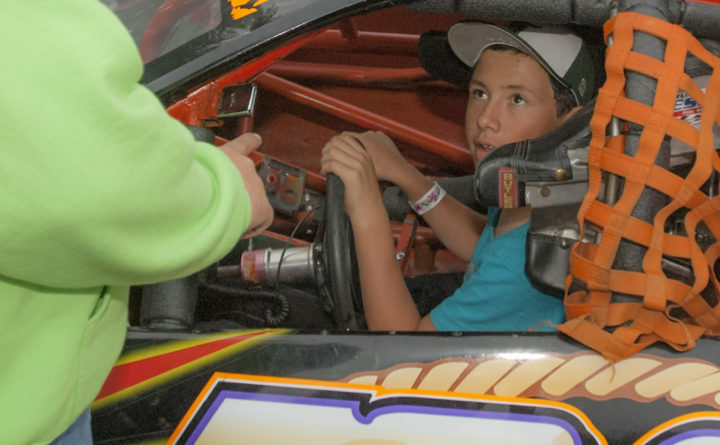 Dylan Street of Old Town listens to his father, Jeff Street, for directions in his pit area before races at Speedway 95 in Hermon, July 5, 2014. When Old Town-Orono took the ice at Sawyer Arena in Bangor for Monday night’s hockey game against Bangor High School, it was without a key player in Dylan Street. The junior defenseman is at Boston Children’s Hospital recuperating from an infection related to a chronic health condition. Black Bears’ first-year head coach Chris Thurlow believes Street will miss the rest of the season. Street has a rare illness called hydrocephalus, an inflammation of the brain that can cause bleeding and swelling. He lives with a shunt, a small tube that leads from his brain to his stomach and drains the excess fluid from his brain. Thurlow said Dylan Street had been complaining about stomach pain for a couple of weeks and had been seen recently at a local hospital. The pain became severe early Sunday morning while at his home, so Street was taken to Boston Children’s Hospital. “They knew his situation down there because they installed his shunt,” Thurlow said. Street, a junior, had emerged as the leader of the defense corps after senior Cam Tower suffered a broken collarbone. The defending state Class B champion Black Bears had already graduated two quality defensemen in Josh Wheeler and Austin Soucy and Finnish exchange student Antti Jarvikare also didn’t return. “Dylan was up to about 10 points in seven games and that’s what he had all of last year. He has been a big factor, especially with our captain [Tower] out,” junior center Tyler McCannell said. McCannell said the Black Bears will have Street in their minds for the rest of the season and they will have to “stick together as brothers” to persevere without him. Thurlow said they played Monday’s game — won by Bangor 3-2 — for Street and then “we’ll go back to the drawing board” in trying to compensate for his loss. “We’re pretty stretched back there. We have a lot of youth,” Thurlow said. In spite of his illness, Street has remained active. In addition to his hockey career, Street is also a catcher on the Old Town High School baseball team and he is a stock car racer who competes in the top division, Late Models, at Speedway 95 in Hermon. Street finished 10th in points in the the Late Model standings at the Hermon track last year. He was told by his family doctor that he couldn’t play football, however. Thurlow said folks involved with Old Town-Orono hockey will hold a fundraising dinner, public skate and silent auction on Feb. 10 at Alfond Arena in Orono to help raise money to defray his medical costs. He said the “whole hockey community, spearheaded by the Maine Junior Black Bears,” will be involved including all the other high school teams in the area.